AvL Technologies’ 3.8m motorized vehicle or trailer mount antenna was designed and built for heavy duty commercial and military applications. This quad-band antenna features a three-piece reflector for ease of stowing. 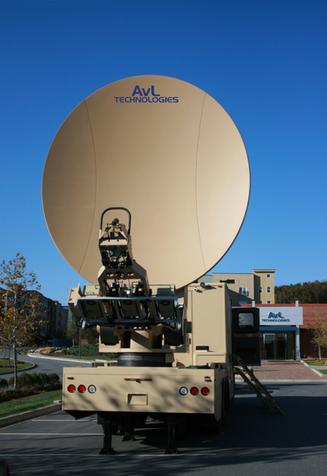 AvL’s Military antennas are industry leading performers with top-caliber, lightweight materials and components. These antennas offer unique features such as ultra low-stow dimensions, high wind tolerances and numerous interchangeable feed options. The Military antenna family offers exceptional performance and ease of operation that’s ideally suited to military applications. These antennas are frequently mounted on military Special Operations vehicles and other military trucks and trailers and used in signal contribution for high data rate and bandwidth as well as high power broadcast or similar applications. All AvL antennas are designed to meet and exceed the highest performance requirements around the world to guarantee both satellite authority compliance and peak in performance, reliability and availability.